In the rarified world of contemporary opera, few sub-categories are as obscure as that of operas written specifically for children. It's a genre that, in the second half of the 20th century, at least, had something of a flowering, with contributions from composers like Britten, Menotti, Henze, Davies, and numerous lesser composers whose works are designated "school operas" and are generally performed as part of the outreach of opera companies with the goal of introducing school-age children to the concept of sung drama. An even more arcane subgenre is that of the children's opera written to be sung by children, which, with the exception of very few works like Britten's The Golden Vanity, seem destined to be of interest almost exclusively to the performers and their parents and perhaps some of their peers. 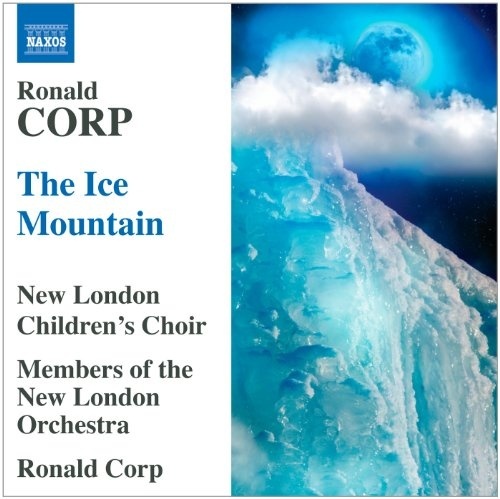 Ronald Corp's The Ice Mountain, a substantial work lasting almost an hour and requiring young singers of unusual discipline and sophistication, may not find a broad general audience, but it's an encouraging landmark to have a significant work in this genre created and recorded. Corp has extensive experience writing for children's voices and choirs, so the opera works well for his performers. His music is frequently notable for straddling classical and popular styles, and that is certainly true of The Ice Mountain. Although the music is not consistent in its quality -- sections of exquisite loveliness are sometimes followed by moments of bland banality -- the opera is skillfully shaped and ultimately emotionally moving. (The most unfortunate aspect of the score is that fact that its main, frequently recurring theme is dangerously similar to the opening of Vince Guaraldi's "Christmas Time Is Here," from A Charlie Brown Christmas.) Some especially effective moments include the haunting song, "See a light shines in the darkness," the love duet, "The girl I love is a lovely girl," and "Gently -- gently We will bear them," and those parts more than make up for the score's weaker elements. The young singers handle their music with polish and professionalism. It takes some adjustment to accept the uniformity of sound of the young sopranos and altos, especially as the more aged characters, and the one role that calls for a boy whose voice has just changed to a light tenor comes as a breath of fresh air. Corp's transparent, evocative scoring for an ensemble of seven players is one of the opera's greatest strengths. Naxos' sound is clear, well-defined, and nicely balanced, with an immediate presence.